More than 500 biologists, including three Nobel laureates, gathered at UCSD Friday to discuss the critical importance that molecules of ribonucleic acid, or RNA, play in maintaining life. Long known as an important carrier of genetic information, RNA is now recognized by biologists as a critical component of the regulation and maintenance of cellular activities. 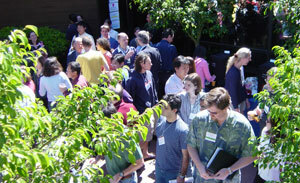 In fact, discoveries in recent years about the various ways in which RNA controls cellular processes beyond transcribing information from DNA to synthesize proteins have led to the creation of a hot, new sub-discipline of biology, generating widespread interest among basic scientists and biotechnology companies working on a range of problems dealing with cell regulation. The UCSD symposium, RNA: Beyond the Central Dogma, not only brought together the world's experts in RNA biology to discuss these new findings. It also gave them the opportunity to pay tribute to Sydney Brenner, one of the pioneers of RNA biology, who was presented at a dinner following the symposium with the 2005 UCSD/Merck Life Sciences Achievement Award in honor of his lifetime achievements as a scientist. 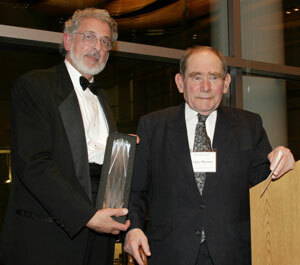 Eduardo Macagno, dean of UCSD's Division of Biological Sciences (left), presents the 2005 UCSD/Merck Life Sciences Achievement Award to Syndey Brenner of the Salk Institute. A distinguished professor at the Salk Institute for Biological Studies, an adjunct professor of biology at UCSD and winner of the 2002 Nobel Prize in medicine, Brenner is the second recipient of this prestigious $25,000 award, established two years ago by Eduardo R. Macagno, dean of UCSD's Division of Biological Sciences. The first recipient of the award was the late Francis Crick, a Nobel laureate also from the Salk Institute who co-discovered the structure of DNA. Crick received the first UCSD/Merck Life Sciences Achievement Award in 2003, the year before his death last July. "Sydney has been a true force of nature in developing new fields of science and in contributing unique and visionary ideas to many disciplines," said Macagno, who presented him with the award. "He is a unique individual, more creative than anyone I have ever known. Being able to sit down and have a talk with Sydney is one of the great pleasures of being one of his colleagues." "We are honored to acknowledge Dr. Brenner's extraordinary contributions to science and humanity with the UCSD/Merck Life Sciences Achievement Award," said Donald Nicholson, vice president and site head of Merck Research Laboratories in San Diego, which provided $50,000 for the award and RNA symposium. "The passion and purpose Dr. Brenner has brought to his work for more than a half century serve as inspiration for the next generation of scientists." A group of science teachers from local area high schools and middle schools seeking to apply the new knowledge about RNA biology in their classrooms also participated in the symposium and in a round-table luncheon discussion on ways to improve science education.